Title text: Someday, some big historical event will happen during the DST changeover, and all the tick-tock articles chronicling how it unfolded will have to include a really annoying explanation next to their timelines. But during which country's Dumb Silly Tomfoolery changeover will the historical event happen? That link.... and another 45 minutes is gone watching a irritated Brit ranting on various subjects. I liked the password rant. Somehow, it's not as boring if there's a British accent involved. I'm sure that Brits don't say that about American accents. We could make things a whole lot easier and dump daylight savings. It is difficult to reprogram sundials twice a year. BHG definitely seems to be losing his grip. This is the second time in a week that he's been thwarted by the pesky details of real life. I'm pinning my hopes on a scenario in which the IERS announces a negative leap second on 31st March 2019, which, through some complexity in the wording of the UK's Article 50 notice, prevents Brexit from happening. It's pretty unlikely (negative leap seconds themselves will probably never be used, and so far only the June and December opportunities have been used even for positive leap seconds), but no more unlikely than any of the things we're being promised by our politicians. First thing that came to mind regarding the bottom text was the qntm.org guy. Second about the alt-text, reminded me about the change over from Julian to Gregorian affecting such things as George Washington's birthday. It could have been amusing to have an episode of 24 take place spanning a DST changeover. moody7277 wrote: First thing that came to mind regarding the bottom text was the qntm.org guy. Also that this change-over didn't happen at the same time everywhere. Favourite example: William Shakespeare and Miguel de Cervantes Saavedra both died on April 23, 1616 - that is, 10 days apart. Yeah, dates are awkward for developers. No, I don't mean romantic dates, although these are also awkward, maybe even more so. I mean dates on the calendar. Of course, the dark haired developer seems to suffer from the illusion that time zones are a geographical feature, when, in fact, the TZ California is in is an entirely political decision. Silly billy, places can't "drift off into a different time zone", because time zones aren't physical. Those cities can be in any timezone they like. And I'll say it once more: abolish not only DST (and friends), but all timezones except UTC. Local time has no bearing to the position of the Sun anyway, so you may as well have your working day start at 17:00 and end at 01:00 if you're somewhere on the west side of North America. And celebrate New Year's either the moment the clock hits 00:00 or when it's midnight proper*. *Though would that be when the Sun is at its "most opposite" point or the midpoint between sunset and sunrise or the midpoint between the last and next time the Sun will be at its highest point in the sky? I thought BHG was better at this whole "supervillian" thing. Getting rid of California? That's downright Heroic. 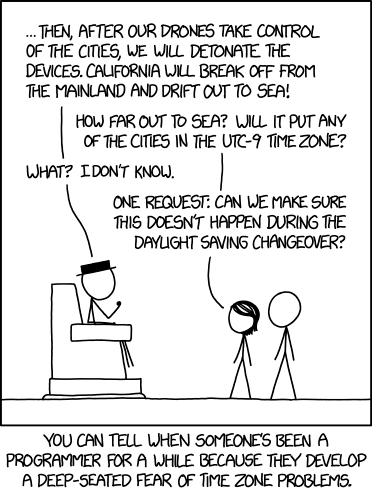 Flumble wrote: And I'll say it once more: abolish not only DST (and friends), but all timezones except UTC. So, at what time does January 4 change into January 5? And where? It's really convenient to have the day change when most people are asleep; granted midnight is not that, but that's a minor confusion compared to changing the date at 4 pm. Getting rid of California. BHG is working for POTUS or Rush Limbaugh. moody7277 wrote: Second about the alt-text, reminded me about the change over from Julian to Gregorian affecting such things as George Washington's birthday. And the October Revolution happened in November to people in most parts of the world. Is that why May Week is in June and the Oktoberfest is in September (or something)? DST and time zones are like democracy: the worst possible system apart from all the others. At 00:00 of course. Yes, that does mean a lot of people will do activities across a 'date line', but we have computers to assist us in telling "this will happen in 3 hours" or "one day and 12 hours" or "two weeks". Dunno what to make of the names of the weekdays though; they're quite useful to get a grasp of when in a week something will happen (like Sunday being "the day before a workday" or Friday being "the last workday"), but if you tie those names to UTC dates, they'll get all fuzzy and useless. Cutting them loose and tying them to local midnight (or 4 hours past, since most people are asleep by then) requires quite a bit of getting used to, though. Luckily we have computers to assist us with that too. I'm pretty sure Oktoberfest is newer than the Gregorian calendar. Far as I can tell from de.wikipedia, it used to be in October and at some point was moved because weather. Nobody could be bothered to change the name. No, I don't see people constantly asking Siri "What day is it? ", especially since in a few years, the answer will be preceded by an ad for something or other. If I didn't already live in UCT (or +1, for the duration) I'm sure I'd absolutely revel in excusing my current sleep/wake cycle by explaining that I was actually trying to keep in synch with Greenwich, or similar. Actually, as a long-time network programmer, I'd say that the experienced ones don't consider it a big deal. You just make sure that the "internal" date/time format is always the POSIX seconds-since-19700101000000Z. There are open-source libraries available just about everywhere that can convert that to whatever date/time/zone/format the users prefer. Going the other direction is a bit trickier, of course, but there are routines that can do it, given the correct information from the date/time string's source. The main problem is people who think they don't need to include a time zone, but you handle that simply by telling them that their dates can't be translated at all until the time zone is included. At first, they'll resist, since to them the time zone is always the same. But you just keep explaining that the computer can't handle their dates because the computer can't know the correct time zone. If they insist that you can handle it by hard-coding the time zone, you mention (in writing that that will fail at the next time-zone change, and will also fail for dates in the past when the switchover dates were changed by their local government. I saw a fun case of this years ago, when I worked for a company that had just installed what looked like a very nice package for precisely coordinating activities scattered across the network, and came with all sorts of useful libraries. We quickly discovered that we were the first customer whose internal network was in several time zones, the US Eastern and Pacific zones. It worked fine in our (EST) lab, so we installed it on a flock of our machines. Suddenly the clocks on the West Coast all jumped to Eastern time. A few minutes later, all the clocks on all the machines jumped to Pacific time. And a few minutes later it happened again. A few dumps of the packets from our handy network monitors showed that the packets used a local date+time format - and didn't include the time zone. Their managers were duly embarrassed by this, especially when their programmers told them "We warned you, but you wouldn't listen, and you ordered us to use that format. Just give us written permission to go against our previous orders and do it right, and we'll fix it." The next day we had an upgrade. This told us that their programmers had understood the problem quite well, and were prepared for the inevitable results of their managers' arrogant idiocy. Our tests showed that their packets had all switched to the binary POSIX time, making their packets smaller and universally usable. I've worked on a number of other projects where our managers accused (accused!) us of sneaking in Universal TIme when they wanted everything in local time. They were right, of course, in the sense that we used that simple second counter internally for everything, but when they asked to "see" our internal time format, we'd just show them the decimal values of several sample times, and point out that they didn't start with the characters "1970" and didn't contain "UTC" or "01/01" anywhere, and that generally worked. It's not that big a deal. The main remaining problem is persuading them to never use input formats that lack time zones, or do dumb things like using mm/dd in some offices and dd/mm in others, so our software knows whether 5/9 is May 9th or the 5th of September. But if computers can hand-wave away all the massive problems you'd cause, like forcing a huge chunk of the world to live their lives in two different days every day, then computers can also hand-wave away all the currently existing problems with time zones. Except for the 0.00001% of the world's population whose job it is to program the computers, I suppose - and even then, as jc points out above, a great many of those problems have already been solved. The concepts of time of day, day of week, and dates were all created so that people in a local area could function together. Despite the "global world" we live in today, that's still what's needed. We all care much more about what time we need to meet other people right where we are than what time it 70 degrees of longitude away. This would be a hell of a lot harder if we said "let's meet Wednesday" and we had to figure out whether that meant two days from now or three. As for Daylight Savings Time, no, it really doesn't serve the purpose people thought it would, and it's become sort of arbitrary, and I don't give a damn at all because I like that the sun sets really late in the summer. As do lots of people, I expect. But time zones are ok. The real PITA are calendar weeks. Especially those that span new year's day (ISO weeks always have 7 days, so they count for the year that has the bigger part of the week). And when you think you thought of everything, you get a bug report in the first week of 2014... because there's a chart that compares the current week's figures to the figures of the same week last year. 2014 had 53 ISO weeks, 2013 only 52. Bummer. sonar1313 wrote: As for Daylight Savings Time, no, it really doesn't serve the purpose people thought it would, and it's become sort of arbitrary, and I don't give a damn at all because I like that the sun sets really late in the summer. As do lots of people, I expect. Massachusetts was talking about moving to UTC-4 year-round (effectively always DST with our current time zone) a couple years back, but like most logical legislative initiatives I don't think it went anywhere. Assuming you're talking about the balmy near(er)-equatorial Massachusetts, you mention thereafter, up here (my whole country is more northerly than all the contiguous States) the near-natural time-zone locally has winter sunrise at about 8:30 (or later, depending on local topography ). For some parts of the country it's after 9:00. The question of making school times mutable to the season aside (I'd support it, also to vary in teenage years as their body-clocks change, but I can imagine it'd play hell with parental schedules, depending on their often already touch-and-go mismatch of work hours and school hours), there's not much traction for perma-DST (or DDST and WDST) locally because/despite the greater extremes of twilight-drift. Someday, some big historical event will happen during the DST changeover, and all the tick-tock articles chronicling how it unfolded will have to include a really annoying explanation next to their timelines. I actually doubt it will be all that complicated. When the missile went over Japan last week it launched in one time zone (30 minute difference), flew over japan in a different time zone, and landed in the ocean in yet another. All of the articles just picked a timezone designation at the beginning and stuck with it. Sure, but you can have "local time is roughly 1PM when Sun is highest in the sky" without changing time zones partly through the year. Maybe now is the time to rise up against our machine overlords, and demand an end to the constraints of non-local time zones. Most of us carry internet-enabled GPS-enabled devices that could tell us precisely what our local time is. When I travel to continental Europe my phone automagically tells me the new time - it could change the time on a continuous basis every time I travel east/west, on a minute-by-minute, second-by-second basis, computing the changes to transport timetables, actually working for me, instead of demanding that I live my life in accordance to the dictats of standard time zones. I admit the computation to avoid transportation accidents, and to schedule meetings etc might be a little tricky.. I've worked on a number of other projects where our managers accused (accused!) us of sneaking in Universal TIme when they wanted everything in local time. LOL. In the post I linked to earlier (the one you were supposed to read in a British accent) I urgent all developers to always do this (store dates in UTC). I never anticipated that I might cause them such trouble. This reminds me that dates in .NET don't store timezone. WTF? That's another topic I'll rant about some day. I think the switchover to DST would be a good moment to do that - the post would have a neat, ambiguous timestamp. I post rarely anyway, I can wait. In the next couple of weeks, I'll be responsible for (a significant part of) a job of recording precise times across 15 minutes of 'natural noon' variation (3.5+ degrees of longitude, and also 8.5 degrees of latitude). The people I'm doing it for would be annoyed if my GPS dictated my offset, and I'd just have to undo all the adjustments again, manually or otherwise. Wee Red Bird wrote: We could make things a whole lot easier and dump daylight savings. It is difficult to reprogram sundials twice a year. I agree, I especially dislike how we make the moon jump back a bit during the changeover. Ummm...this one seems to be ignoring DST. Will be tricky as not everywhere does daylight saving or does it at the same time. It ends in the UK on October 29th but November 5th in America. Flumble wrote: *Though would that be when the Sun is at its "most opposite" point or the midpoint between sunset and sunrise or the midpoint between the last and next time the Sun will be at its highest point in the sky? Why bother working off the middle of the night. Kids (and most adults) see a day as a full revolution of the Earth, but it isn't. It is a revolution far enough to face the sun again. If you worked a day as a full revolution of the Earth, then any place having the sun overhead in the middle of its day in the summer will have darkness in the middle of its day in winter and vice versa. Why not forget about the yellow burning thing and bring ourselves into alignment with the universe? *groan* I'll probably never live to see a year go by without hearing some badly-thought-out DST hating. One day, I'm sure the DST-o-phobes will get their way, or even the one-time-zone-to-rule-them-all crazies, and then I can sit back and enjoy the spectacle of millions of people trying to negotiate summer hours with their employers so their long summer evenings remain intact; traveling to far away places and having no clue when the local restaurants open and close -- yeah, it was soooo convenient not to have to adjust your watch, but what good does it do you to know what time it is when you have no idea what schedule anyone is on? Or did you think we were all going to just start living on the same schedule, light-driven circadian rhythm be damned? It all seems like a horrible dystopia. Last edited by GlassHouses on Fri Sep 01, 2017 11:41 am UTC, edited 1 time in total. Agreed. Its a mess, but a (mostly) necessary mess. DST in particular is useful in mid-latitudes, but kind of useless nearer the poles or equator. not-very-smart phones. These phones could get the local time from the tower, but had no idea of what time zone they were in. I had to write in-appscreens and help to explain to users that they had to set the zone they used the app in, and it was a f*cking mess; not so much the code, but getting users to understand the problem and get it right. There were more screens handling this than there was for the rest of the app.